So I have been thinking about my studio a lot lately. Why would I open up my studio to other people? What am I hoping to get out of this? What am I thinking you might get out of this? Well, it is summertime, just like it says in my journal above. 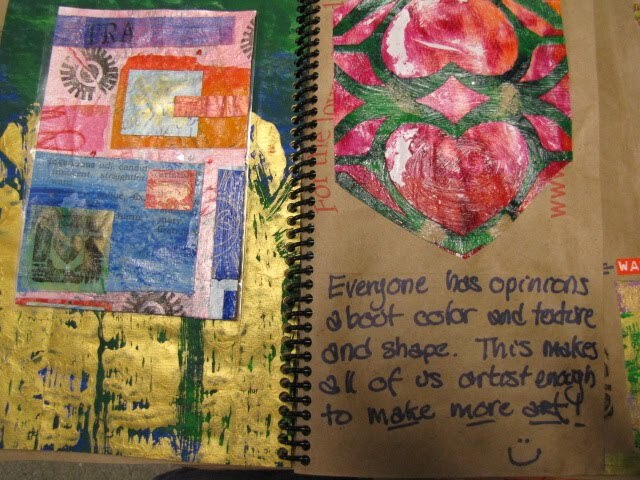 I have been thinking that everyone might like to have an art journal. 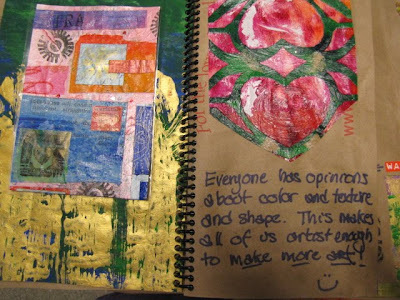 But what is an art journal and why in the world do I keep inviting you all in here to paint, and cut, and glue? Do I think that you all should put your great artistic ideas down on paper to impress us all? Nope. 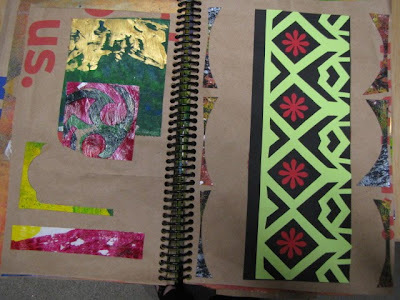 I think that you could put your great and even meager art ideas down on paper because it makes people feel good, and because it is fun to play with color like this, and because when I teach you to do something and you do it slightly differently then I learn something too, and because when we work with color, and space, and shape, and texture we are using our brains in precisely the kind of way that makes us really smart, and because not every day in the summer here in Maine is a perfect beach day, and because I feel so cool to walk around with a book stuffed with fabulous colored papers sticking out as if there iS JUST TOO MUCH WONDERFULLNESS IN HERE TO KEEP WITHIN THE BOUNDS OF A BOOK, and because I bet that you would feel this way too if you had a book like this that you had made, and because it is a pretty cheap way to entertain yourself and your children (the spiral binding is about 4 bucks down at Staples), and because while the school year is about books that someone else wrote to tell you all about what they think, summertime might be a very nice time to make a book that had all kinds of stuff in it that told the story of you. 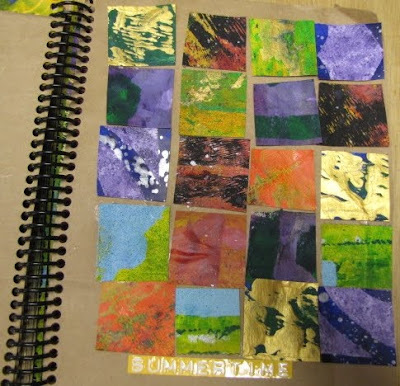 I especially like the top page shown, "Summertime." Those kinds of textural/gestural clips are endlessly fascinating.